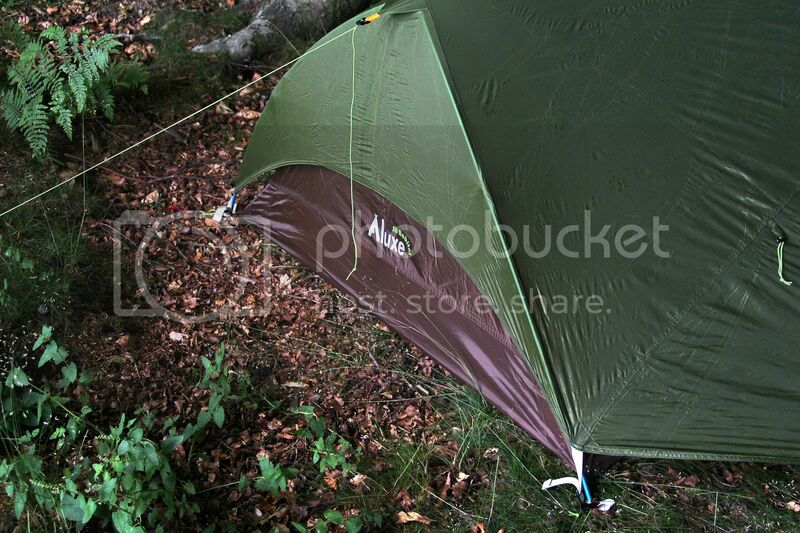 Recently, I've been hankering off a lighter tent for use on both canoeing trips and theoretical walking trips too. 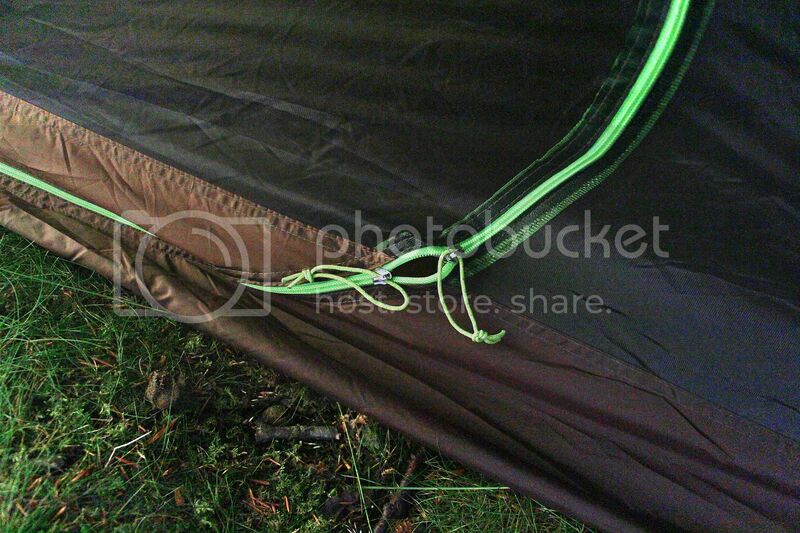 I have a few requirements that I'm quite fussy about, one of which is that the tent must be freestanding, not requiring tension just to stand up, as on numerous trips I've found myself on ground where its difficult to get reliable pegs in. Unfortunately, this means its hard to find many lightweight options. A couple of months ago, I stumbled across the Luxe Outdoor Habitat, a PU coated tent that seemed to fulfil most of my requirements. Unfortunately, there were non in stock. I contacted Backpacking Light, who said they hoped to get some more in and would let me know. Sadly, in the end they let me know that they wouldn't be getting any more. However they did point out that they had a siliconised nylon version, which was slightly bigger but a similar weight, approx 2kg, which matched my approximate target weight. There were a few questions I had, which were all answered excellently, including the need to seal seams (recommended but not essential), and the cut away nature of the ends on the Sil-Version. So, I ordered one for £160, and it arrived literally the next day, with a handwritten note and a packet of wine gums. Here are the specifications as per the Backpacking Light website. The Sil Habitat is slightly larger than the PU coated version and it is also slightly lighter and small to pack. 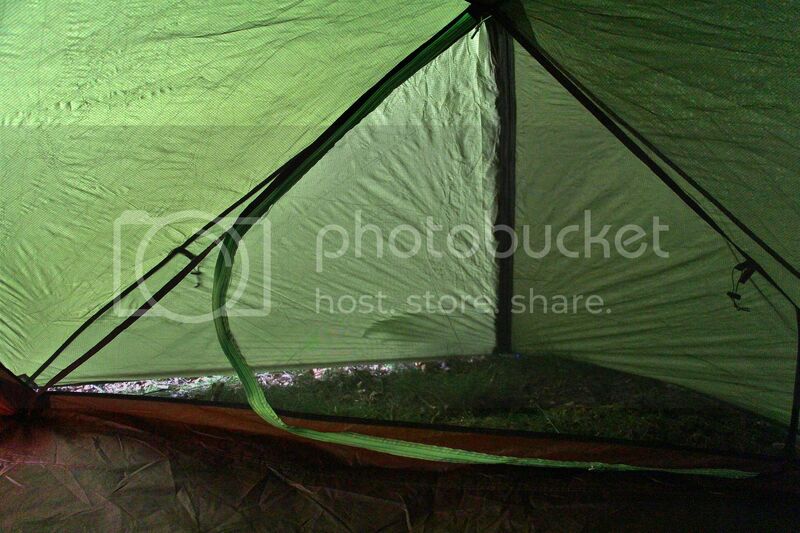 The inner is mesh only, so not really suitable if you are looking for a shelter for winter use. However it does make it ideal for those needing something for the rest of the year, or more ventilation in warmer climates. 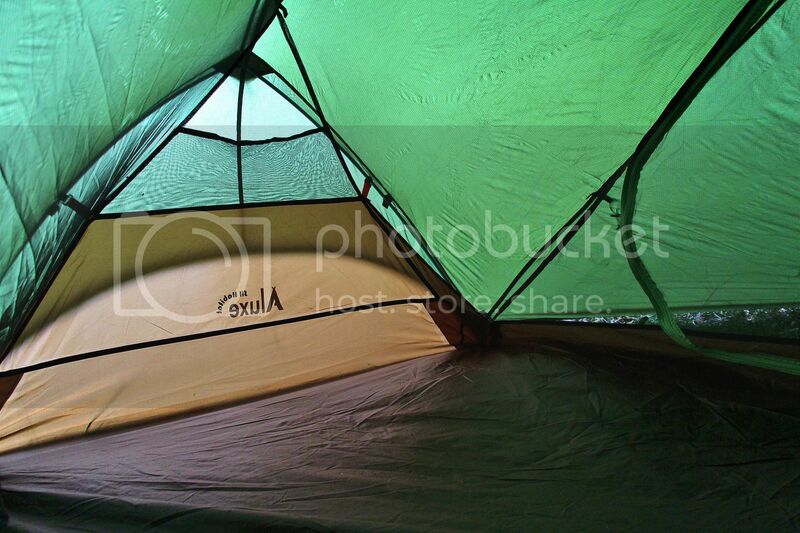 It can also be pitched without the inner, by using the included footprint which has location holes for the poles. With two vestibules it offers excellent storage for two users or one person with equipment, such as a cycle tourer or motor cycle tourer. 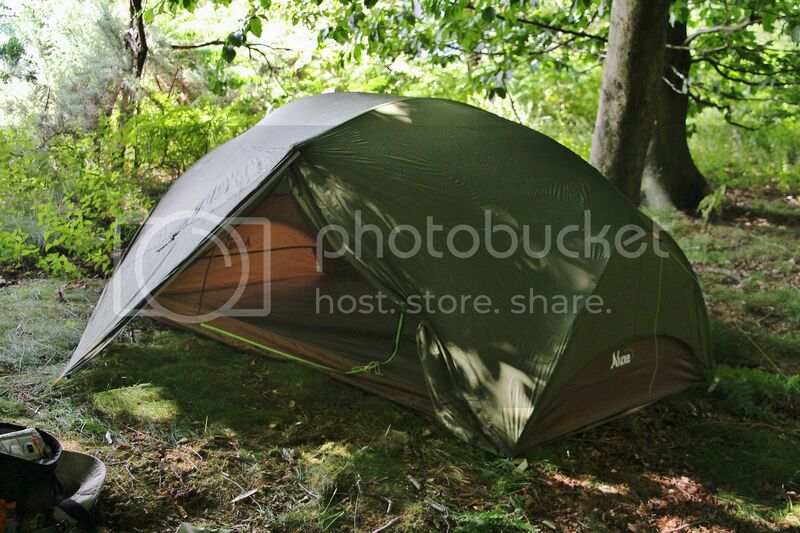 Please note that shelters which use Silicone based fabrics will require additional seam sealing and we recommend that users apply the (supplied) sealing on the inside of the flysheet along the stitching and seams, in order to obtain better weather protection if the tent is going to be subjected to persistent rainfall. Comments: Larger than standard Habitat for taller users. Two spacious vestibules. Good ventilation. Full mesh inner. Can be used fly only with footprint. 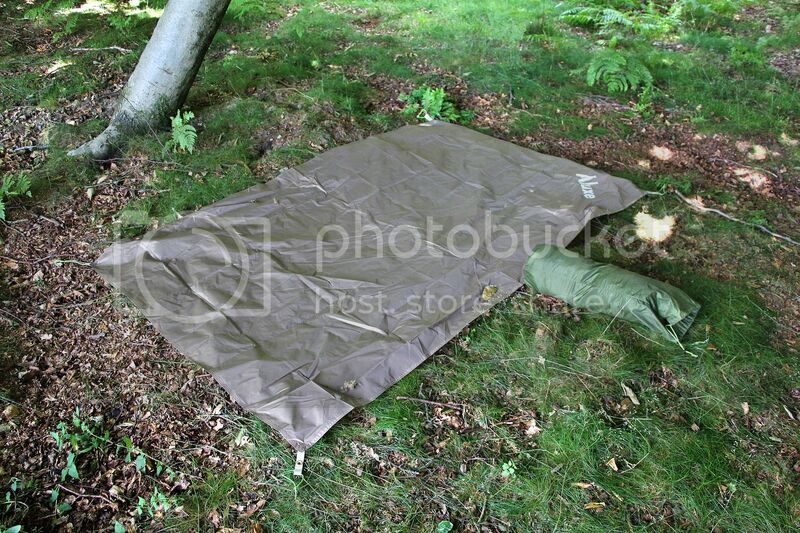 Assuming you're pitching the whole tent, simply throw the inner on the floor (on top of footprint if you're using it). The main pole is an all in one unit and clicks easily together to form the frame, and this is again easily poked into the corner eyelets. You then clip the inner to the poles, and add a central cross pole to give extra headroom. 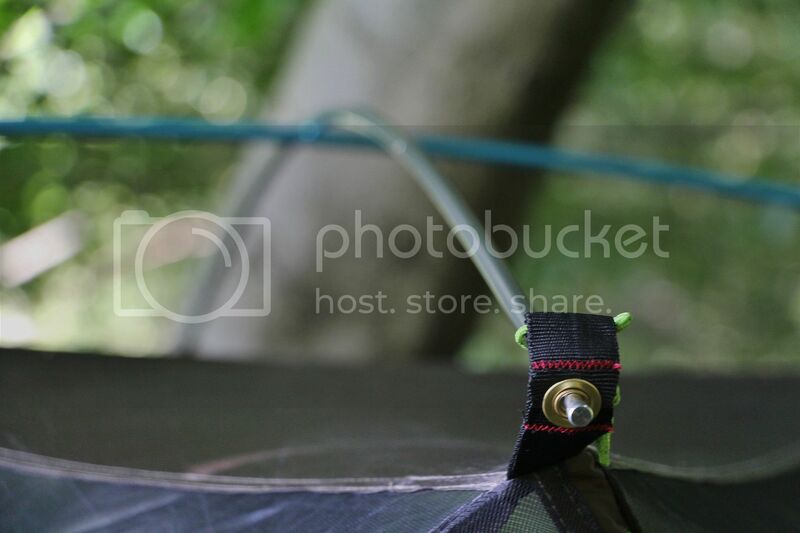 The flysheet simply throws over the top, with 4 small velcro internal tabs that match the poles, and then adjustable webbing straps pop over the pole ends and can be tightened. 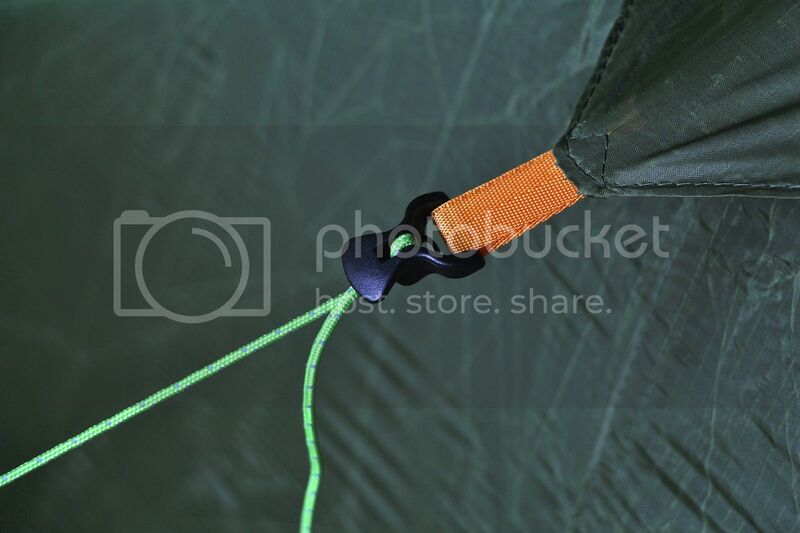 Now you can peg out the tent using the ultralight "Y" channel pegs which are superb, but painful on the hand! There are only 2 guys lines, one at each end. 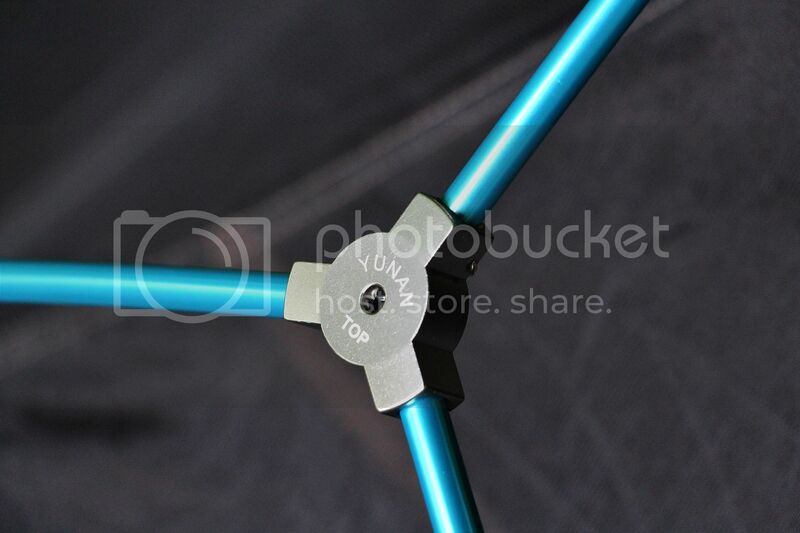 These have very simply but clever tension adjusters with single-strand guylines. 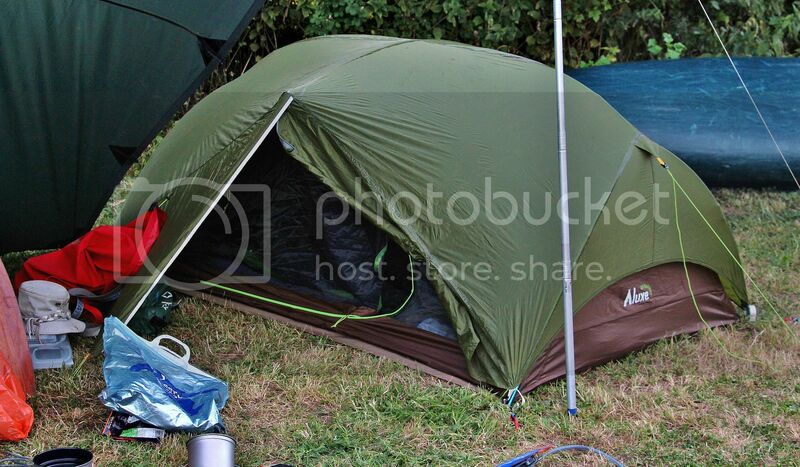 I've used the tent 3 times now, once on a sneaky wild camp in the Surrey Hills, and twice on the river with the canoe. And I can basically say I'm very pleased with it. The weight is pretty much spot on as per the specifications. This means my theoretical lightest without the inner would be around 1.5kg with the footprint, which is pretty good for a full 2 person tent. To be honest, though, most of the time, at about 2.2kg total, most of the time I'd take the whole thing. Space wise, its remarkably spacious, almost as big as my Vango Halo 200, just a little lower and with slightly smaller porches. Its actually bigger than I need, but I'm sure that the space will be used! The lower doors make it a little harder to get in and out without brushing against wet flysheet, but the inner is covered even with the door open. 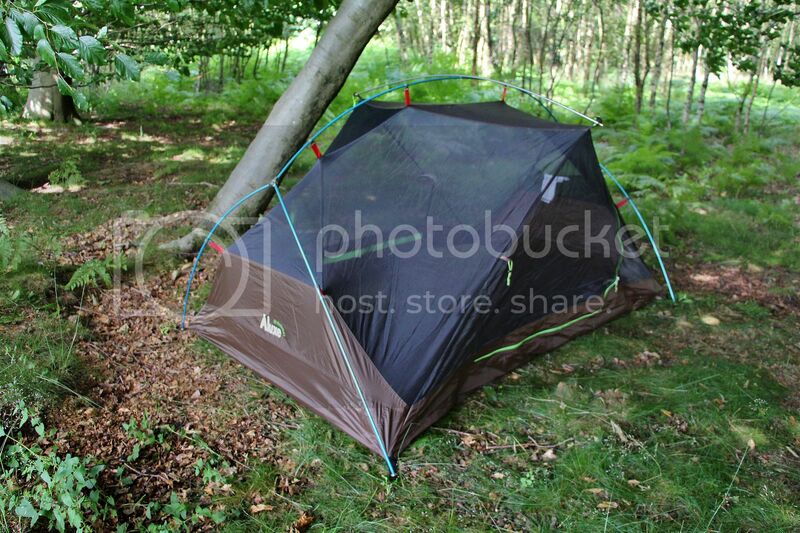 The mesh inner is great in summer, which is when I mainly expect to use this tent. 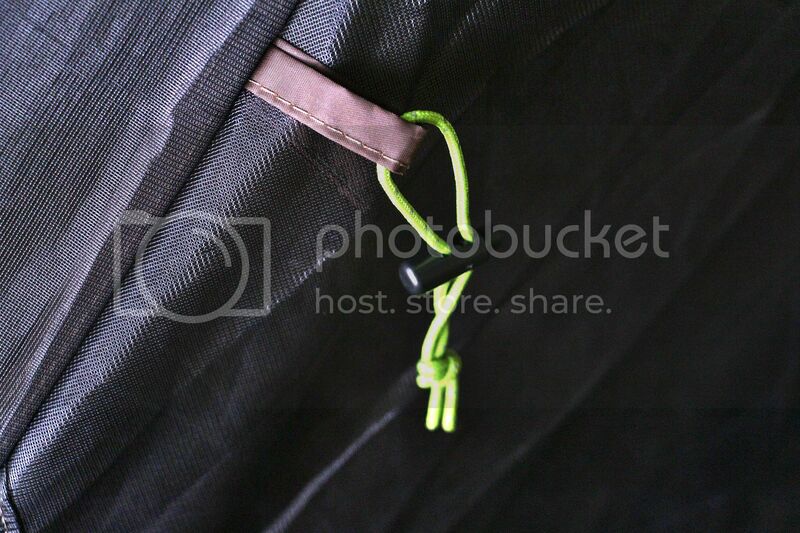 Inside are a couple of decent end pockets, and little hanging loops. Little details impress, such as the simple use of little pieces of cord for zip pulls, which work well but save weight. The door ties are in theory, neat, but actually quite fiddly to use in the dark. This is based on a US designed tent, and it shows. The ends of the flysheet are cut in a rising curve, which is good for ventilation, but less so for protection from wind-driven rain. The inner groundsheet of the inner does, though, rise much higher than the curve at the ends, so there shouldn't be any issue when used with the inner, but as a fly-only shelter it may reduce the effectiveness and allow rain to puddle on the footprint. The rest of the fly comes nicely to the ground. Stability of the inner is pretty decent, but no 4 season tent, but because the fly is unsupported between corner and the end of the cross-pole, the wind can blow the fabric onto the inner. Its rated as 3 season, my personal feeling is that this is only just. It won't blow away, but in strong wind the outer will press onto the inner at these points, and it needs a guy line there. Given that this is where the door ties are, I might try it with a thin line, but they are not designed to be load bearing. Time will tell. 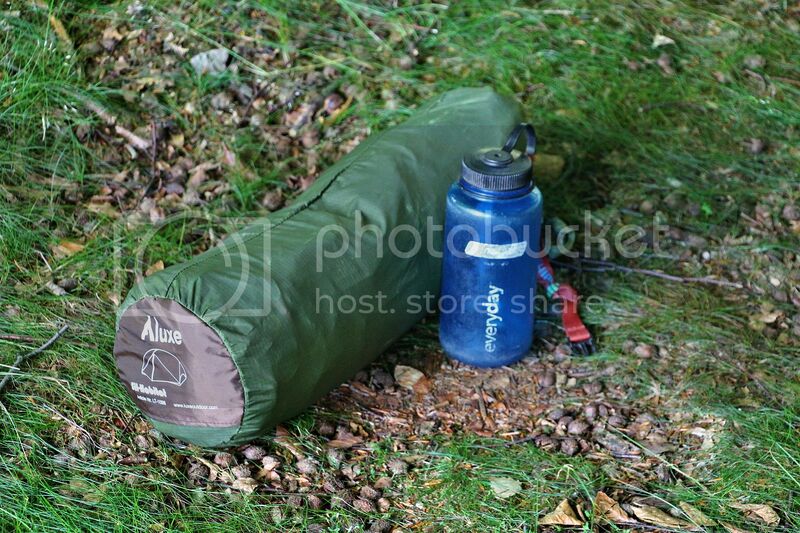 I had condensation on the 3rd time I used it, but it was "one of those nights" and everything we had was soaked by morning, in the porch, under the canoe, everywhere. The previous two times I had zero condensation. The main outer zips only open from the bottom, which is a shame as it reduces venting options, and there are no other vents in the outer, so I guess those raised-curve ends do help airflow. Reflective strips by the doors, and thread in the guys, make it easy to spot at night, but overall the green is the perfect shade to blend in with the environment. The various bags are generously sized, so its easy to pack away, yet the packed size remains pretty small. This is where I think it stands out ahead of similarly priced Vangos and the like. The siliconised nylon fabric is very light, but very strong and has a decent 2500mm Hydrostatic Head, but with it being sil-nylon I am assured its effectively much higher as it doesn't degrade. The floor is 5000mm and a good balance between light and tough. All the metal parts are excellent, light and nicely finished. The stitching throughout is immaculate. I'm really impressed so far. The Sil-Habitat is really light for the amount of sheer space you get, and for lowland UK use I think its going to be a real winner. I'm not entirely convinced it will comfortably sit out a Highland gale without flapping over the doors, and wet outer touching inner, this might be the only limiting factor, but with a mesh inner I wouldn't intend to use it as a base camp tent in winter anyway, that's not what I bought it for. 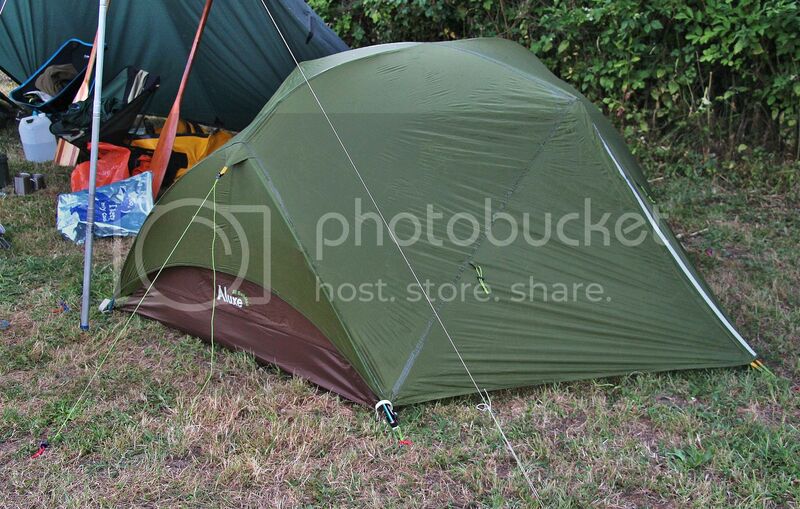 The true selling point to me is its versatility and flexibility - use the inner as a midge net under a tarp, or in a hot summer, or just take the outer for a high bivi. Weight, space, quality, porches, pitching speed, mesh inner, free standing design, inner or outer can be used on its own, pegs, quick pole set up. Lack of vents, ability for fabric above door to flex in wind, high curved ends, fiddly door ties. Time will tell if it stands up well to wind driven rain.